Naturally 7, an acapella group from the Bronx, New York is currently blowing away audiences around the country. Last Friday night, we were lucky enough to catch them perform in Melbourne in the beautiful Hamer Hall. Having watched a couple of videos of seeing them make incredible renditions of instrumental sounds using just their mouths, I was expecting to be somewhat impressed, hell I had made a gamble to see them based on two youtube videos. However, I didn’t expect to be blown away by their talent as much as I was. What is amazing about this group is the incredible talent each member brings. Being an acapella group, they use their voices not only vocally but also to create instrumental sounds to support the vocals. Each member has a specialty albeit electric guitar, drums, the trumpet, the list goes on. My favourite would of definently had to be the electric guitar sound as you just couldn’t tell the difference. The group come from all different backgrounds from around the world however they all have one thing in common; they are all linked to Jamaica in some way which has influenced their music style. Throughout the show, it became that the group were influenced by a large range of different musical styles. Their originals were gospel influenced while they did renditions of some crowd favourites such as Queen, Simon and Garfunkel as well doing John Farnham’s ‘The Voice’ which had the crowd singing along loudly. There was also another really important element of the evening and that is that this group were not just touring for themselves but they also came with an important message. With the tour being presented by World Vision Australia, the group had an important message to share about the wonderful work that is being done by the World Vision Australia around the world in particular Cambodia which they visited recently and the need more more support so children and communities can grow, develop and become sustainable in the future. It was a message well received with many people choosing to Sponsor A Child during the evening. All in all it was an incredible night of an interesting array of songs and sound effects by a group of some of the loveliest men despite coming from the rough hood of the Bronx, while at the same time supporting a worthwhile cause to help children and communities to grow and develop in less fortunate countries around the world. 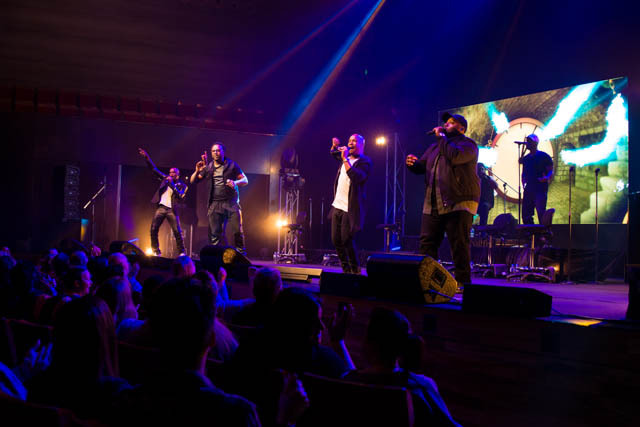 Tags: concert, concert photography, livemusic, livereview, Music, musicreview, Naturally 7, review, World Vision Aus, World Vision Australia. Bookmark the permalink.